Wyn can use his skills to entertain both around tables at a restaurant, and to mingle amongst the guests in the environment of a large gathering - sometimes amassing a considerable crowd. If your function is a large one requiring several entertainers, Wyn has a carefully selected network of colleagues, from other magicians to caricaturists, human statues, jugglers, musicians and even ‘balloonologists’ to call upon. He has worked with these acts not only in Bournemouth and Poole, but also all over the country. Often in London, Manchester and beyond. Many of these acts work in the Dorset and Hampshire regions, but what they have in common is that they are professional acts of the highest standard. And how about an after-dinner cabaret? After you have been dazzled by Wyn’s magic close-up, sit back and watch a hilarious comedy/magic routine - incorporating audience participation when the event calls for it (fancy getting the M.D. involved?). Sometimes, it’s not a case of keeping the troops happy, but of impressing clients. What better way than to take them to dinner, and have a superbly presented show which can include subliminal (or downright obvious) messages about your product? Imagine somebody signing a card, shuffling it in to the pack, and for it to appear inside a zippered compartment of a wallet. The card is then kept, and it can have your logo, product details or anything you wish printed on it. Wyn works with a professional designer and printer in Bournemouth and can arrange for this work to be done. Other circumstances where Wyn, with his smooth presentation and amiable personality, can be of use include product launches, seminars, or even a Magic Workshop as a team-building exercise. As well as including a short demonstration, Wyn’s team-building Magic Workshop has the participants learning magic tricks and rehearsing presentation skills, before demonstrating their newly acquired skills to the other members of their group. One thing that guarantees bonding is keeping a mutually exclusive secret! Bournemouth and Poole is a base for many large blue-chip companies and as a magician based in Dorset, Wyn is in a great position to service the needs of his clients in a professional and competent manner. Finally, Wyn is able to come into the workplace and get involved with Awards Days. He can present the certificates/trophies etc, all the while employing his comedy compering skills, and also involving his magic. He has found that these sorts of events, to be especially motivating, and the employees have gone back to work buzzing with enthusiasm. Have a top corporate magician attract crowds around your booth. Have a professional presenter deliver key issues about your product. Utilise his skills to ensure a memorable stand for delegates. There are many magicians around that work at trade shows, so the question is why use Wyn Jones at your trade show? Well, in answer to that you only have to look at what he has to offer that others may not. Before he got into the Entertainment industry, Wyn worked in sales for several years, and uses the experience he gained there to great effect. He has even been a delegate at trade shows and also worked the trade shows as a sales person. As we know, people skills and ‘selling yourself’ are the keys to selling a product and this is never truer than at trade shows. As Wyn also works as a comedian, his interpersonal skills, and the ability to ’break the ice’ ensures your stand has happy relaxed potential leads. Flexibility is the key, and Wyn’s presenting skills have ensured that at many trade shows, he has been employed to present quizzes, and run presentations and activities, with his comedy skills coming into the fore to be able to improvise and adapt to any situation. Your product, or service can be woven seamlessly into any presentation at the trade show, and any messages can be delivered in a professional and entertaining way. Wyn’s purpose is to act as a bridge between clients and your sales staff, and to create a positive image for the company, product or service. 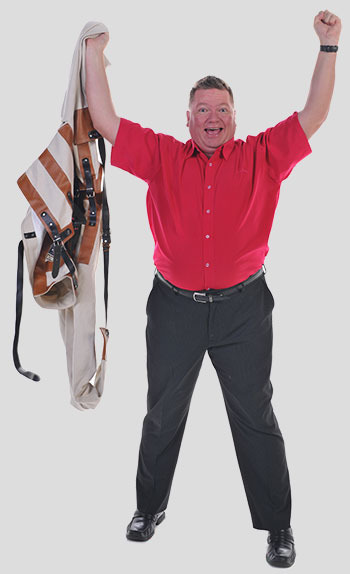 Call Wyn to discuss how he can help you to create a winning stand at your next trade show.